By using the BeamFinder, you can find answers to questions like "Which satellite beams can I receive at my location with my current equipment? 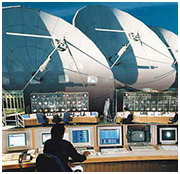 ", "How do I aim my satellite dish to receive a specific satellite beam?" or "What dish size do I need to receive a specific satellite beam?". When the setup is complete, your position will also be indicated by a red dot in the footprint maps. If you are logged in, you can access a BeamFinder demonstration which also indicates receivable TV channels with the possibility to control an ACU (Antenna Control Unit) and a satellite receiver (based on Enigma 1/2 OS). Please press the button below to start the BeamFinder setup procedure.